Your data is kept in several different tables of your data file. To make data entry easy you may 'see' your data through a form. Forms help to group and label fields by subject and to avoid data entry errors. But for certain tasks like searching, sorting and filtering it may be more adequate to view your data as table. 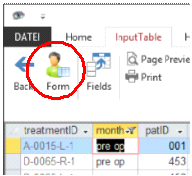 You may switch between form view and table view any time using the icon buttons 'table' and 'form' on the icon bar. Datagraph will memorize the last setting you used and will display your data either on a form or as table, depending your last setting.